Whether celebrating a newborn’s arrival or momentous first birthday, this bunting lends an air of happiness to the occasion. 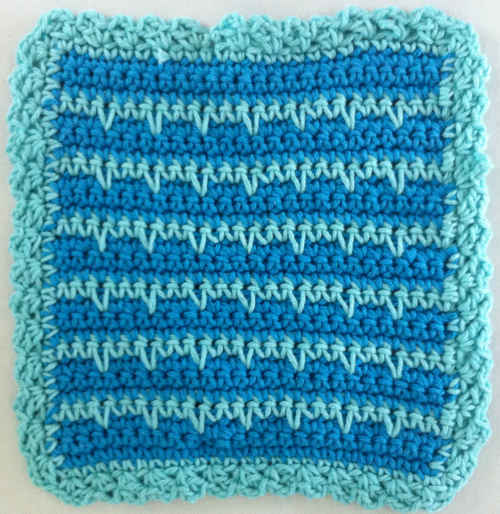 For everyday decorating crochet your pennants in your nursery’s colors and hang them at the window or on a wall. Gauge/Tension: GAUGE: With larger hook, 20 sts and 18 rows sc = 4″ (10 cm). CHECK YOUR GAUGE. Use any size hook to obtain the gauge given. sc2tog: [Insert hook in next st, yarn over, draw yarn through st] twice, yarn over, draw yarn through 3 loops on hook. 1. Pennants are worked separately and buttoned together to form a banner. 2. Striped pennants consist of 2 rows per color stripe. Non-working yarn is carried loosely along side. Carried yarn strands are covered by working edging over strands. Warning: Buttons and small pieces pose a potential choking hazard. 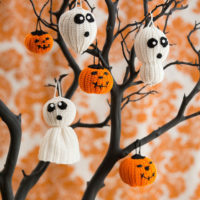 Use care when hanging bunting. 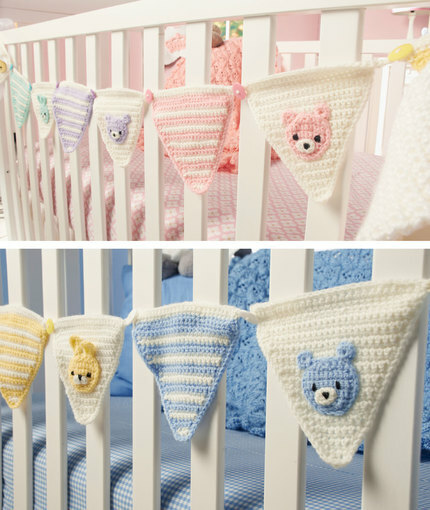 If hanging on a crib, buttons can be eliminated and pennants can be sewn directly together. Starting at top, with A and larger hook, ch 26. Row 1: Working in back bumps of ch, sc in 2nd ch from hook and in each ch across, turn – 25 sc. Row 2: Ch 1, sc in each sc across, turn. Row 3: Ch 1, skip first st, sc in each st across to last 2 sts, sc2tog over last 2 sts, turn – 23 sts. Rows 4-23: Repeat Rows 2-3 (10 times) – 3 sts at end of last row. Row 24: Repeat Row 2. Row 25: Ch 1, skip first st, sc2tog over last 2 sts, turn – 1 st. Fasten off. Round 1: With right side facing and larger hook, join A with a slip st in top right-hand corner st, ch 1, working across opposite side of foundation ch, sc in each ch across, 3 sc in corner st, rotate to work across side edge, work 25 sc evenly spaced across to bottom point, 3 sc in point, rotate to work across other side, work 25 sc evenly spaced across other side edge, 2 sc in last corner; join with a slip st in first sc. Work now progresses in rows. Row 2: Ch 1, working across top edge of the pennant, sc in same st and in each st across to next corner, turn – 25 sc. Row 3: Ch 1, 2 sc in first st, sc in each of next 23 sts, 2 sc in last st, turn – 27 sc. Row 4: Ch 1, sc in each st across, ch 8, sl st in last sc made (button loop). Fasten off. Weave in ends. Make 1 pennant in stripes consisting of color A & each of the 4 colors for girl- B, C, D, E ( 1 pennant in stripes of color A & colors C & F & 2 pennants in B for boy version ). Row 1-2: Following directions for the solid pennant, begin rows with colored yarn for 2 rows, add color A at end of 2nd stripe row, do not finish off colored yarn. Row 3-4: Work 2 sc rows of color A, changing to colored yarn at end of 2nd stripe row, do not finish off color A. Row 5-24: follow instructions for solid bunting in 2 stripe per color pattern as directed, do NOT change color at end of row 24. Row 25: Ch 1 & turn, skip 1st st , sc 2 tog, finish off color A. Round 1: With right side facing, join CC with a slip st in top right-hand corner st, ch 1, working across opposite side of foundation ch, sc in each ch across, rotate to work across side edge, work 25 sc evenly spaced across to bottom point, 3 sc in point, rotate, work 25 sc evenly spaced along other side edge; join with a slip st in first sc. Fasten off CC. Row 2: With right side facing, join A with a slip st in top right-hand corner st, ch 1, working across top edge of the pennant, sc in same st and in each st across to next corner, turn – 25 sc. Row 4: Ch 1, sc in each st across ch 8, sl st in last sc made (button loop). Fasten off A. Weave in ends. With smaller hook hook, ch 4. Row 1: Sc in 2nd ch from hook, sc in next ch, 2 sc in next, sc in last ch, turn – 4 sc. Row 2: Ch 1, sc in first sc, 2 sc in each of next 2 sc, sc in last st, turn – 6 sc. Row 3: Ch 1, sc in each of first 2 sts, 2 sc in each of next 2 sc, sc in each of last 2 sts, turn – 8 sts. Row 4: Ch 1, 2 sc in first sc, sc in each of next 6 sts, 2 sc in last st, turn – 10 sc. Row 5-7: Sc in each st across, (10 sts). Row 8: Ch 1, skip first st, sc in each of next 7 sts, sc2tog over last 2 sts, turn – 8 sc. Row 9: Ch 1, sc in each of first 2 sts, [sc2tog over next 2 sts] twice, sc in last 2 sts, turn – 6 sts. Row 10: Ch 1, skip first st, sc in each of next 3 sts, sc2tog over last 2 sts, turn – 4 sc. Row 1: working across side edge, bottom edge and other side edge, work 21 sc evenly around around 3 sides, join with a slip st in first sc of Row 10. Fasten off. With smaller hook, ch 5. Round 1: Sc in 2nd ch from hook, sc in next 3 ch, 5 hdc in next ch, working across opposite side of foundation ch, sc in each of next 3 ch, join with a slip st in next ch. Fasten off, leaving a sewing length. Work same as Bunny Head. With smaller hook, make an adjustable ring. Round 1: Ch 1, work 8 sc in ring, do not join, tighten ring. Fasten off, leaving a sewing length. With smaller hook and A, ch 4. Round 1: Sc in 2nd ch from hook, sc in next ch, 3 sc in last ch, working across opposite side of foundation ch, sc in next ch, 2 sc in last ch, join with a slip st in first sc. Fasten off A. Refer to photograph while finishing. Sew Muzzle to Bunny or Bear face using sewing thread. For Bunny, stitch triangle shape at top of muzzle and fill in. Shape muzzle by making a vertical stitch with sewing thread at bottom center and pull tightly. For Bear, nose is located in middle of muzzle; stitch triangle shape and fill in. Embroider eyes on face. Sew Ears in place. Sew a Bunny or Bear Head in center of each Pennant. Sew Bunting onto pillow top using sewing thread in swag formation or as desired, leaving individual pennants loose. * = repeat whatever follows the * as indicated.